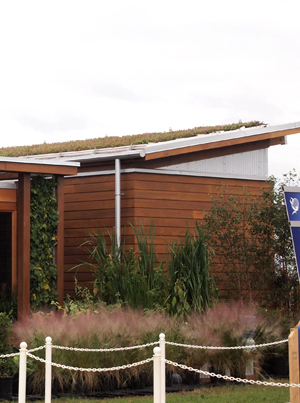 The Solar Decathlon, a design competition and public education program run by the U.S. Department of Energy, returns to the National Mall this year, where it will be open September 23 – October 2. Like the competition two years ago (see earlier post), teams of architecture and landscape architecture students from universities around the world compete to design, build, and then operate the most “cost-efficient, energy-efficient, and attractive” solar-powered home. The team that reaches optimal energy production, maximizes all efficiencies, and combines design excellence with affordability, takes home the top prize. In 2009, Team Germany beat out all the top talent from the U.S. and Asia with their innovative cube home entirely covered in solar panels. Given all the fundraising needed to create these projects (some of these model homes cost hundreds of thousands to create), not many of the schools from 2009 appear again this year. A whole new set of competitors are in play. All projects have the requisite solar photovoltaic or solar thermal systems installed in various places on or around the home, but in terms of integrated site design, the University of Maryland’s WaterShed was the most innovative project this year. An attempt to create a “micro-scale ecosystem,” the project truly integrates building and landscape and uses “living systems,” or constructed wetlands to recycle and reuse greywater from sinks and showers. In combination with the wetland, exterior native plantings, edible gardens and walls, and a green roof mean the site will not only be highly energy efficient but will also be extremely water efficient and have zero stormwater run-off. 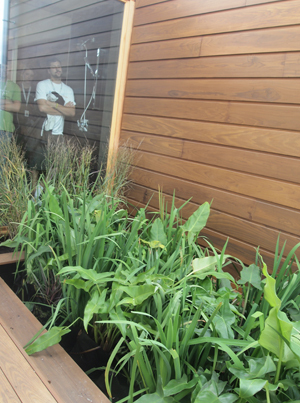 Using plants native to this region, which creates habitat for local birds and insects, architecture and landscape architecture students at UMD constructed the wetland right outside the home’s floor-to-ceiling bathroom window so it’s clear that water from the sinks and shower flow outside to the wetlands, where the water is then cleaned and reused to irrigate the landscape. 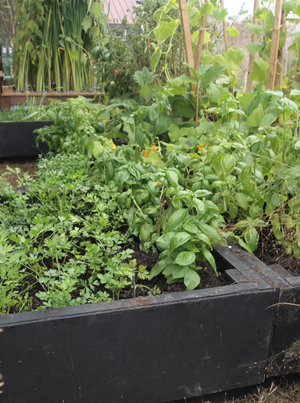 However, their landscape also does more than clean and recycle wastewater, it also produces food. Veronika Zhiteneva, a student with the UMD team, explained that a garden plot with vegetables can help a family in their model home “live more sustainably and with greater self-reliance.” Near the garden plot, there’s also an edible wall made of twisting grape vines. 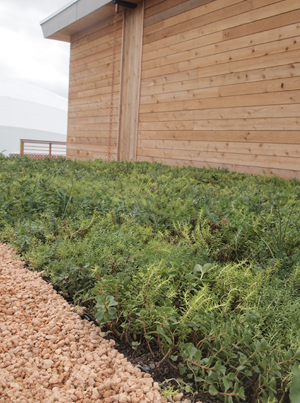 The building’s green roof, which was grown by LiveRoof, is comprised of 150 2.5-inch deep trays, which feature six different types of sedum. Placed on the north side, the green roof not only reduces energy use by 25 percent, but also slows down and absorbs any stormwater. Any excess rainwater not captured by the roof is then soaked up by the surrounding native plants. 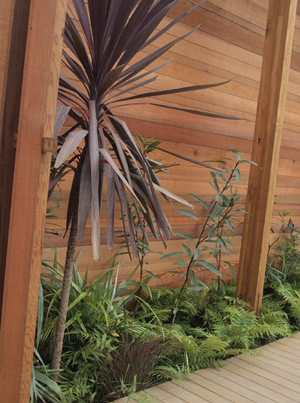 In fact, the entire project, from the wetlands and native plantings to the garden and edible wall to the green roof, are designed to ensure the home only offers positive impacts on the surrounding environment. Scott Tjaden, another team member, said “our inspiration is the Chesapeake Bay,” which has suffered major impacts from agriculture and stormwater run-off. Indeed, of all the projects in this year’s Decathlon, WaterShed seemed to offer the more thoughtful approach — it places high value not only on energy efficiency, but stormwater management, water efficiency, and biodiversity too. Among the other 19 model homes on the Mall, a theme this year was edible landscapes. A student from the Middlebury College team (see below) said these homes “offer an opportunity to produce your own food.” Their project had an indoor “greenhouse wall shelter” for growing herbs and seedlings that could be moved outside to the garden plot once they grow larger. 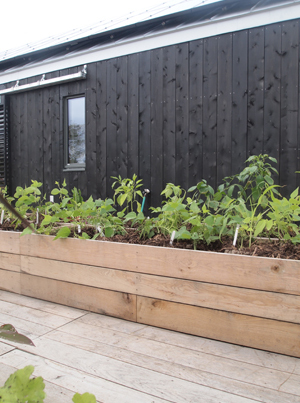 “The local food movement is part of living sustainably.” The team from the University of Illinois at Urbana-Champaign also added an edible garden around the exterior of their home. Parsons The New School of Design and Stevens Institute of Technology worked with Habitat for Humanity to create a real home that will be turned over to a family in the Deanwood neighborhood of Washington, D.C. once the competition is over. Parsons said the family was actually brought into the design process early on and they requested a rooftop food garden, which will be accessible via the second floor of the home. One fun element was a Parsons-designed cookbook offering recipes for the foods grown in the home. 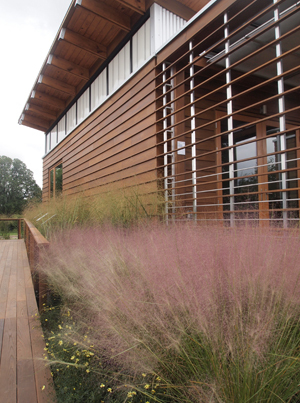 In addition, their home is designed to have zero stormwater runoff: a rain “spigot,” which funnels water into a rain garden, captures any stormwater coming off the roof. Any excess runoff will be stored in a 2,000 gallon tank buried under the house and then reused for irrigating the landscape. Eventually, when the home is put in place in Deanwood, two bioswales will be installed at either ends of the house to capture stormwater. Their project is also designed using PassiveHaus technologies, including extra thick walls and glazed windows. Lastly, there are alpine zones featuring “unique flora” and another productive landscape offering opportunities for growing herbs, veggies, and fruits. 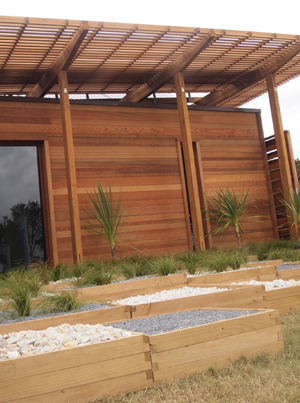 The landscape provides water efficiency and stormwater management value. Team New York from the City College of New York came up with another unique approach that uses 30 percent less water than the conventional home: Shower and sink wastewater is recycled and reused. Also, some 30,000 gallons of rainwater will be captured via external banks of native plants that a landscape architecture faculty advisor helped select and install. New York’s project is designed to be placed on top of the roof of an existing New York City building in an effort to “increase density and encourage car-free living.” This approach is made possible by a “dunnage” system that distributes load through steel beams. 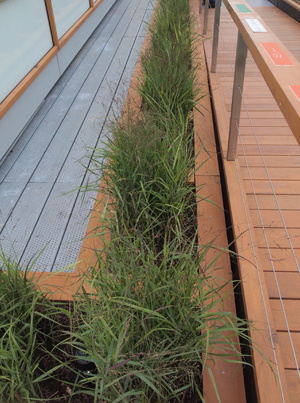 The idea is to then plant a green roof around the rooftop home that will function as a yard and garden. Innovative use of materials, including non-conventional materials and building waste, was another big theme running through the homes. 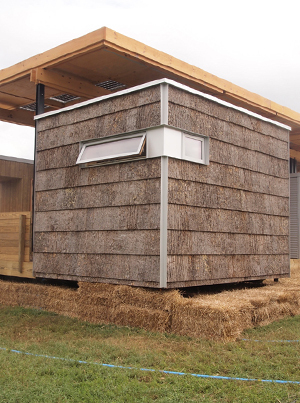 The best example of this was the team from Appalachia State University, which beautifully reused corrugated iron as siding and internal walls, along with a natural, locally-sourced bark siding that is “soaked, flattened, and then kiln-dried” into sheets that last up to 80 years. One student said the bark is a “by product of the lumber industry.” Very smart reuse of a little-considered material. Explore the 20 teams on the National Mall this year. In 2009, more than 300,000 visited the Decathlon in 10 days. Get there early this year to avoid long lines. Yes, treatment wetland is the right way to clean up grey and black waters (produced by human and also by industrial or other activities). UN millenium development goals set Environmental sustainability as one of the goal that mut be reached, and treatment wetland play an important role on this way for humanity development. My personal congratulations to the UMD students that prepare this work and because the use treatment wetland as system to clean up water that is also able to produce water that could be re-used. Great work. Hey friends, more info about constructed wetland could be also find on my blog. Feel free to contact me I like wery much help people that start to work in wetland solutions. Dave. This is similar to an eventual goal we have for our wildlife center. We are in the process of moving (hopefully), and as we design the new center, we hope to integrate similar solutions in our buildings and enclosures.